There are a lot of different avenues for playing fantasy sports. The reason for that is the gigantic popularity of this genre of online games. 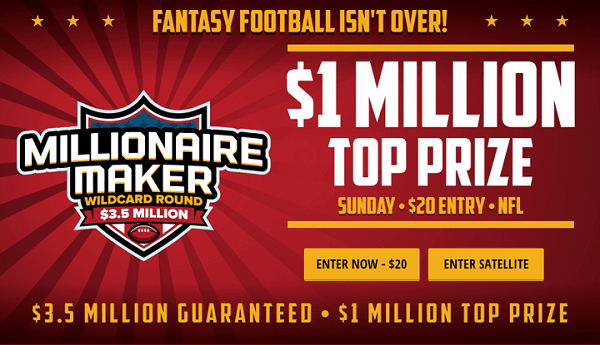 In fact, some people would state that it is inaccurate to label fantasy sports as merely online games. It is definitely a lot more exciting and rewarding than simply playing 2D virtual football on an online game site. The popularity of fantasy sports has not been overlooked. Nearly every major news provider in the United Kingdom and the sports news providers in the United States and other countries have been able to come up with their own versions of fantasy sports. Some of the ones in the United Kingdom only focus on football, as it is by far the most popular game in Britain. Others include sports that are also quite important and significant to British culture and lifestyle. One such sport that has found a place in the heart of millions of the Britons over the last century or so is the game of Rugby. Rugby and football are similar in a lot more ways than we like to imagine. They are often perceived as sports that stand at two opposite ends of the spectrum. This is not true at all. If there was a sport that is completely different from the game of football, then it is cricket. Rugby on the other hand shares many features that can be easily found in the game of football. For example, rugby is rugged, wild and fast paced, things that we can easily associate with football, especially the fast flowing football played in the Barclays Premier League. But there is something else that forms a deeper connection between rugby and football. It is the passion for the game. There may not be as many followers of rugby in the United Kingdom or in the world as there are of football, but that does little to change the fact that the fans of rugby and the players who play the game in the pitch are nearly as zealous about this sport as the fans of football are. Rugby is not simply a brutal sport for big burly men who like to bump into each other. It can be a very sophisticated and highly technical game like football is at times. Since there is an element of strategy involved, there is room for people to come up with the concept of fantasy rugby and implement it effectively across the nation and the globe. Fantasy rugby is not much different from fantasy football. The basic working mechanism is the same and the skills required to master fantasy rugby are pretty much the exact same ones that you would need to win a contest in fantasy football. That being said, you actually need to watch the game of rugby on a regular basis in order to develop expertise in the field of fantasy rugby as all contests are based on the real life performances of real players in the real life matches that are going on in the United Kingdom or in other parts of the world. There is one difference between fantasy rugby and fantasy football. Unlike fantasy football, the central appeal of fantasy rugby stems from international matches that see national sides going up against one another. The concept of domestic rugby is nowhere near as popular as domestic football. International rugby creates much more hype than international football other than the times when major international football competitions take place. Although most of the online sports betting sites and fantasy sports contests providers have provision for the game of fantasy rugby, there aren’t too many better places than the ESPN website for stepping your foot into the world of fantasy rugby. Why should you choose ESPN? Well the answer is quite simple. When they tell you that they are the worldwide leader in sports and sports entertainment, they are definitely not kidding with you. ESPN has as big a sports coverage as any other sports news entity in this world. They know the ins and outs of all the sports they are dealing with, especially the sports that are popular in the United Kingdom such as rugby. You can never expect them to come up with a faulty version of fantasy rugby or give you an inconvenient or unfair system to play with. 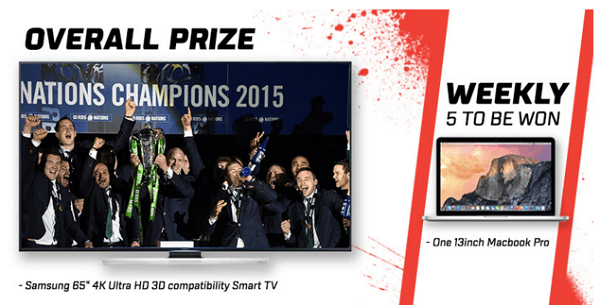 ESPN’s content and contests on rugby are simply state of the art. The contests are also very well sponsored, which means that fantasy rugby players can compete in the big leagues with the hope of earning some big cash prizes. 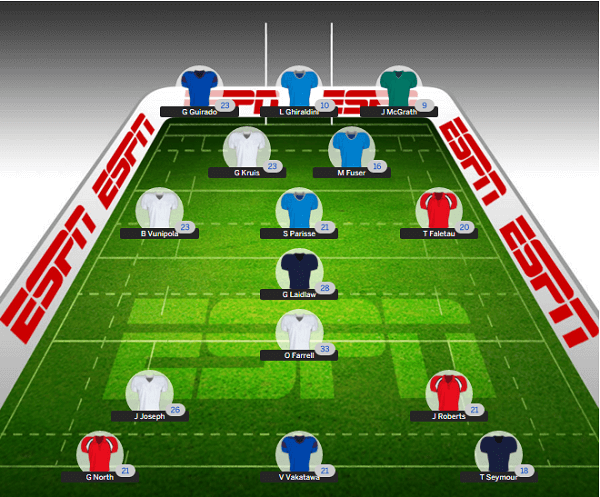 If you are lucky, you could even win a trip to the rugby world cup if you draw success in ESPN fantasy rugby. 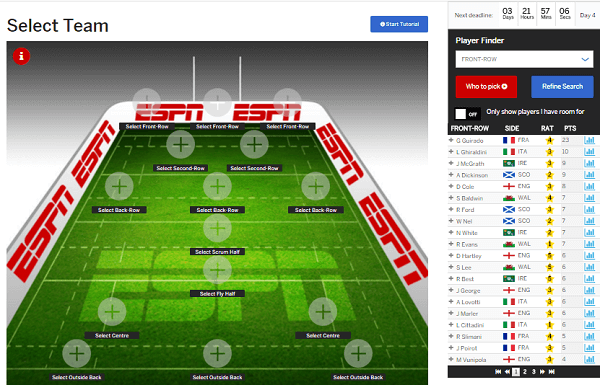 Playing ESPN fantasy rugby is all about selecting a 15 man squad during the course of a tournament. This should be a team of world beaters who will earn you points on the basis of their performances in real life. You have the chance of making daily transfers and competing with your friends to win some fantastic prizes. The team that you select must include 3 front row forwards, two second row forwards, one back row forward, one scrum half, one fly half, 2 centres and 3 outside backs. As mentioned before, fantasy rugby is more focused on international games than domestic competitions. Thus, instead of having a fantasy rugby season based on a league, you have fantasy rugby based on the world cup, which is simply known as ESPN Fantasy Rugby world cup. During the group phase of the tournament, you will be afforded the liberty of selecting a maximum of three players from each representing nation. The limit will be raised to five once the knock out phases of the tournament commences. A team of your creation must be specified a name. We recommend that you come up with the most intimidating team name possible to keep up with the aggressive spirit of the game of rugby. Much like fantasy football, you will be awarded points based on positive or negative contributions by your players on the field. For example, an assist earns you 3 points while a red card fetches you negative 2. Before the start of a tournament, you have a transfer amnesty where you can make an unlimited number of changes. This allocation changes to a 15 transfer limit once the tournament begins.